IGFA Trustee Michael Farrior and Ken Jones, President of UPSAC present Claire Christy her High angler in the 12 year old division award. What do you get when you mix in a beautiful southern California day, youngsters eager to catch a fish (any fish), and a hard-working group of local and more distant volunteers? The answer in this case was the second annual I.G.F.A. 2011 Oceanside Pier Kids' Fishing Derby held last week. 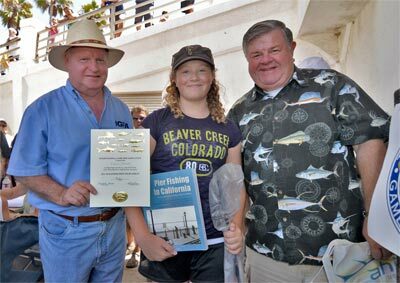 Sponsored by the International Game Fish Association (IGFA), United Pier and Shore Anglers of California (UPSAC), NOAA, and the Oceanside Pier Bait and Tackle, the event was declared a rousing success by all. Although the fishing was a little slow, the anglers, many who were fishing for the first time, managed to pull in a nice variety of SoCal species that included halibut, kelp bass, barred surfperch, walleye surfperch, spotfin croaker, yellowfin croaker, white croaker, queenfish, sargo, jacksmelt, mackerel, and a baby bat ray. The capture of the fish yielded ten age-group winners. The winners were: 6-year-old Carlos Cruz, 7-year-old Emily Dipitro, 8-year-old Kathryn Oh, 9-year-old Riley Bryant, 10-year-old Angel Flores, 11-year-old Elvis Rivera, 12-year-old Claire Christy, 13-year-old Mikey Pugh, 14-year-old Edward Dizon, and 15-year-old David Hernandez (who was the grand champion in 2010). The Grand Champion this year was Mikey Pugh. Each of the winners received a new rod and reel, an autographed copy of Pier Fishing in California, and a beautiful IGFA certificate. The grand champion also will have his name engraved on a perpetual trophy that stays at the pier. Twenty youngsters won free raffle prizes and all of the participants received "goody bags" filled with a plethora of gifts. The main coordinators were Ed and Pam Gonsalves of the Oceanside Pier Bait and Tackle shop and Ken Jones, President of UPSAC. They were ably assisted by IGFA's Mike Farrior and Gary Graham, UPSAC Board members Eugene Kim and Hashim Nahid, Marty Golden from NOAA, and a large group of volunteers including the judges from the Oceanside Senior Anglers Club - Lee Wood, Dan Ontiveros, Manuel Ontiveros, Hal Reeser, Ray Wilkerson, Fred Kazzmerek, Jim Swartz. Joining the crowd was the Mayor of Oceanside Jim Woods and Councilman Jack Fuller. Filming the event for KCOT TV was Video-Photographer Bill Stromberg. Among the groups and businesses donating prizes were Oceanside Pier Bait and Tackle, Anglers Bait and Tackle, Arcadia Tackle, Charles Belñavis T-Shirts, Danielson Mfg., Helgren's Sportfishing, IGFA, J&M Bait Distributors, NOAA, Pacific Coast Bait and Tackle, Pat's Bait and Tackle, Pierfishing.com, Promar, and Ruby's Restaurant.